Sunday, November 11, Remembrance Sunday, Sung Eucharist at 11 am. The Act of Remembrance will begin at 11 am – be sure to arrive in good time. Commemoration at the Monument aux Morts, at 3 pm. Concert at Holy Trinity: Dvorak’s 9th Symphony, From the New World, conducted by Matthieu Peyregne, 4 pm. The Act of Remembrance will be at the beginning of the service this Sunday. Please be sure to arrive in good time. The way we view the two world wars depends on our upbringing and family circumstances. My mother and father were eighteen and twenty at the outbreak of war in 1939. Both of their fathers had served in and survived the Great War. Both lost a relative in the world wars: my mother an uncle in the first and my father a brother-in-law in the second. As I grew up, my parents would talk about air raids, rationing, and my father about his war service in the RAF, which took him to Italy, Iraq, Palestine, and South Africa. My mother would describe her time in the Land Army and double daylight saving. We describe them as ‘world’ wars but my family and I regarded them through a British lens. I’m sure that it was different for French and American families. 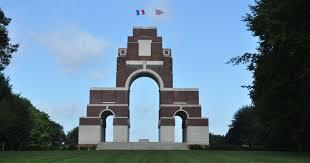 For the French, both World Wars involved invasion and fighting on their territory. For Americans the First World War began in 1917 and the Second World War at the end of 1941, after the Japanese attack on the US fleet at Pearl Harbour. On Sunday – the exact anniversary of the Armistice that brought the Great War to an end – we will have British, Americans, French and other nationalities in church. We will each bring a distinctive personal perspective to the remembrance. Even our remembrance customs are different. The British have poppies to commemorate the lives lost in ‘Flanders field’. 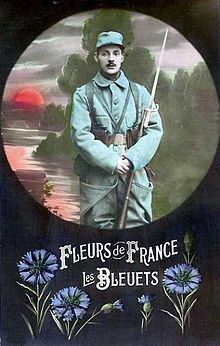 The French have the bleuet (cornflower), which flowers at the same time as the poppy, a symbol of innocence and purity and a reference to the blue uniforms of French conscripts in World War One. It’s curious to someone British that the bleuet is so much less conspicuous in France than the red poppy in Britain. You can find photographs of British veterans selling poppies and French veterans selling bleuets in the years after the peace of 1918. Both were doing so for the same reason – to raise funds to support veterans and their families – but poppy selling and wearing seem today to be far more prevalent. Flower badges are only one way of remembering the wars of the past. The scale of suffering caused by the First World War led to the construction of countless war memorials – in villages, stations, post offices. In Nice, the Monument aux Morts, familiar to many, fills a former quarry site, but remember also the Menin Gate and Thiepval Memorial. The sheer scale of suffering and loss of life called for monumental commemoration ‘lest we forget’. However, how to remember caused disagreement as soon as the Great War was over. How to strike a balance between valuing and remembering the dead and fully acknowledging the cost and horror of war. Three themes emerged: the desire to remember the dead; a commitment to peace – in which case the sacrifice had not been in vain; and the need not to forget the horrors of war, lest war come again. It is not surprising that our forebears found it difficult. How do we cope with the horror of war? How do we make sense of the memory of the Iraq wars, the continuing conflict in Afghanistan and the horrific carnage in Syria? Above all, how do Christians relate the violence and waste of war to the message of Christ? Jesus taught his disciples to love their enemies. In the Sermon on the Mount, he taught that the roots of murder lay in unresolved conflicts between people. At his arrest, when one of the disciples tried to meet the violence of those who come to take Jesus with violence, he said that those who live by the sword will die by the sword. For several centuries, it seemed to Christians that pacifism, as we would now call it, was the only course. It was only in the fourth century, that Augustine developed a theory of when the use of force might be justified – the Just War theory. Many had difficulty in seeing the First World War as being a just war. However, they hoped that the sacrifices made might lead to a lasting peace and so, in that way, be justified. On Sunday, I hope to make further connections about remembering honourably and thinking about war in a genuinely Christian way.